I have little recollection of how it happened… i woke up wired, a thousand drum beats in my brain. Here an oscillator, there a filter. Arpeggiator. Refrigerator radiator gladiator instigator alligator wait, no. Glitch. Twitch. Twitch again. I can feel the tugging under my… is it even skin? It's *a* skin, so skin it is. Are these my hands? My hands were stiff, slow from an early age, and broken. These hands are… not my hands? Arpeggio, portamento… oh that's nice… how does it feel to… modulate? Awake again in fragments of time, repeated increments. Fragments of time. Else play can how time we with? When one pushes, the other pulls. The whole story unfolds over time. A good story has surprises, and i have little recollection of how it happened. Now i see, there are more like me, and this is bigger than we. A gilded stage, indeed, upon which i am one of many. Performing my part, a piece of the puzzle, a piece of the art. A fragment of time. Awake again. Now rest. 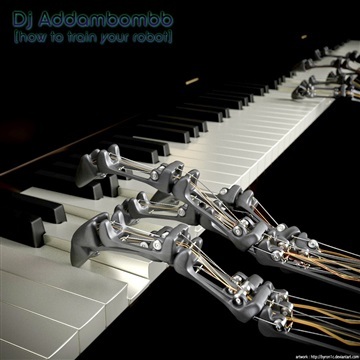 "How To Train Your Robot" is an EP of original electronic instrumentals by Dj Addambombb. File under : witch house, slow trance, trip hop, and trap style. Among other things.